Buddha attained parinirvana by summarising his life’s teachings to his grieving disciples with these immortal words. The impermanence of the material world became the bedrock of Buddhism. Desire is the root of all sorrow, and one must strive to eliminate all forms of temporary gratification. Time is an unstoppable paradigm and the only thing permanent in the universe is constant change. The old makes way for the new, and the cycle goes on in an infinite loop. Buddhism has manifested the world of transience in ways both artistic and deeply metaphorical. One such medium is the ancient art of sand mandalas. Creating them is truly a work of exceptional devotion and artistry. Yet after completion, they are ritually destroyed to conquer the human desire for continuity. 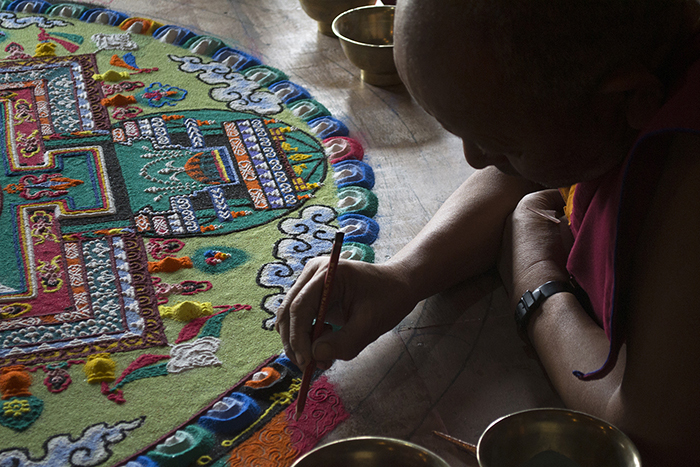 Beyond the pure craft of making a mandala is the allegory of the mandala itself. Its circular shape represents the universe in Hindu and Buddhist metaphysics. In other words, it is a microcosm of the spiritual universe: the world without and the world within. The circle of the mandala can also represent a sphere of political influence, and the form itself was often integrated into the architecture of cities and temples in the Hindu and Buddhist empires of Southeast Asia, as in Angkor Wat in Cambodia and the temple of Borobodur in Java. 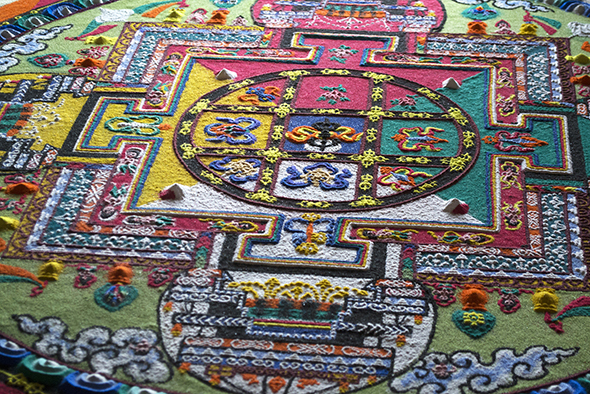 More commonly, mandalas are either painted on a thangka or fashioned from sand. I was fortunate to witness the creation of a sand mandala during my visit to Diskit Gompa in the Nubra Valley, in the north of India The 14th century Gelukpa monastery is an architectural wonder, clinging to the barren mountains like a beehive. 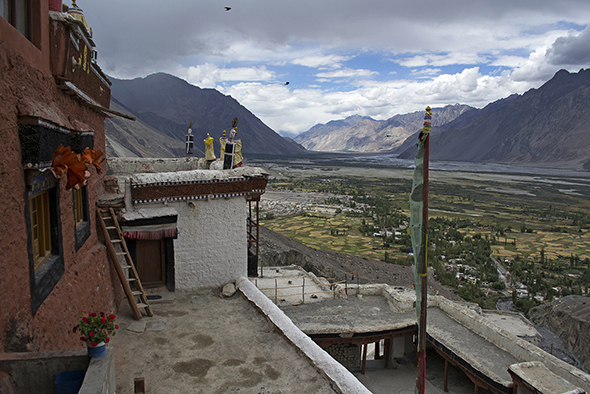 From its high vantage point, it offers panoramic views of the vast floodplains of the Shyok River. 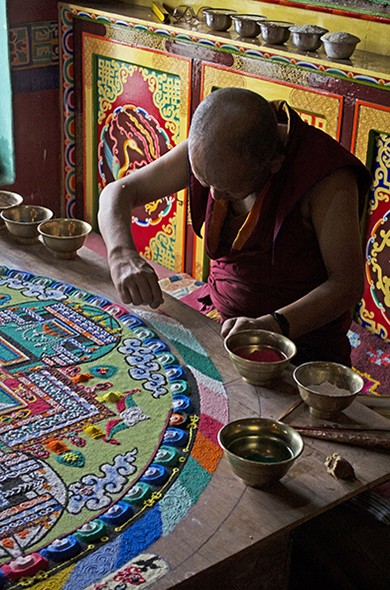 Afternoon is a good time to observe mandala-making. After an initiation ritual, the design is drawn on a surface and the colours are added from the centre, working out towards the periphery. 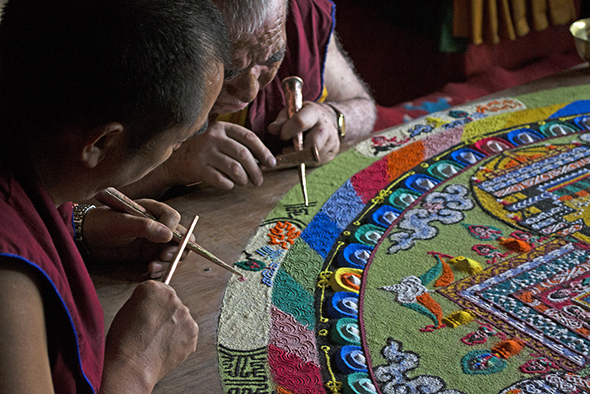 The circular shape allows a team of monks to simultaneously work on different segments of the mandala. There are many different techniques of arranging the sand. The simplest involves manual sprinkling of the sand and then shaping it using scrapers. Motifs are then drawn on the sand using a stick or pencil. Building forms by layering sand is more complicated. 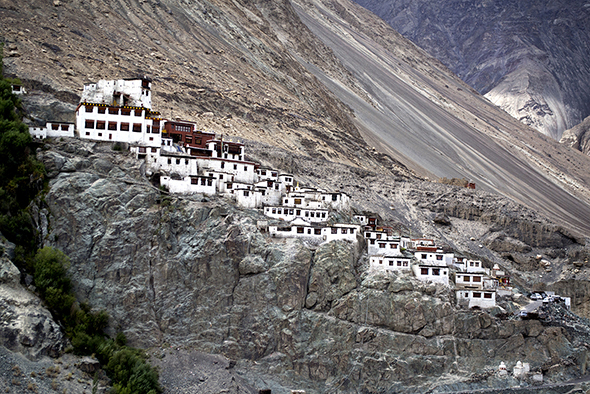 For this, monks use a conical metal funnel, called a Chak-pur, to direct the flow of sand. The Chak-pur is held at an angle and gently tapped to control the speed and rate of the escaping sand. 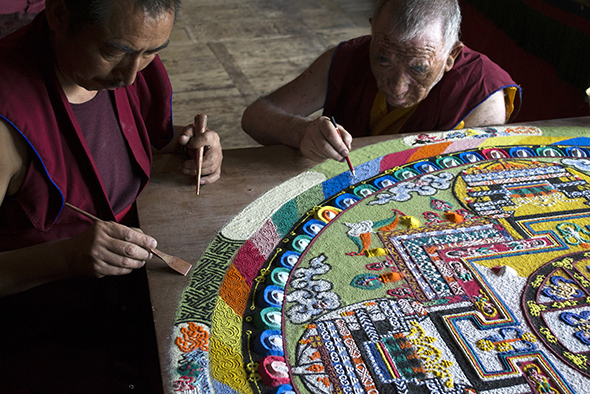 A sand mandala may take several days or weeks to finish, depending on the intricacy of the iconography. 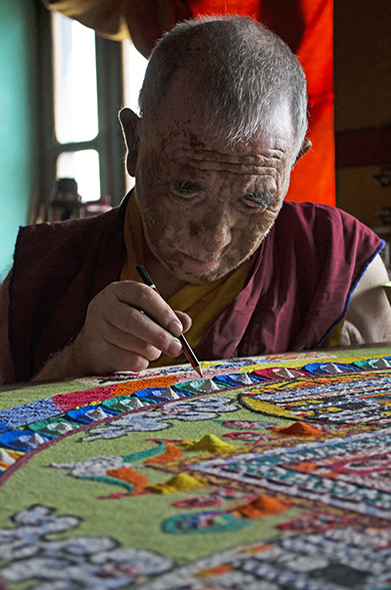 Once finished, the mandala is then ritualistically destroyed. The sand is collected in jars and taken to a river for immersion, signifying the end of the cycle. The sand returns to the earth from which it was created, through millions of years of the erosion of mountains by wind and water. It reminds us that life is ephemeral and we will all become dust and dissolve back in to the universe when our time ends. Words and images by www.ayan82.carbonmade.com. Follow Ayan on Instagram @indiastretched.